House Sencha - Sencha is a large family of steamed Japanese Green Teas spanning every grade from coarse to sublime. Our House Sencha is a pleasant everyday tea that is vegetal and slightly sweet. This Sencha also makes a great iced tea during the warmer months and pairs marvelously with lemongrass, ginger and all citrus. Gyokuro Asahina – From the Uji prefecture, Gyokuro means “Precious Dew Pearl” and is the highest grade of Japanese green leaf tea within the 3-tiered grading system. Special straw mats are spread over the tops of the tea plants toward the end of their growth to provide shade, which imparts the subtly sweet flavor for which Gyokuro has come to be revered. An especially verdant tea with a soft, delicate flavor, this tea is perfectly suited for an afternoon of reflection. Genmaicha – Roasted brown rice and whole leaf Japanese Green Tea are happily married for this classic blend. The toasty, nutty flavor soothes the spirit in colder months and also makes for a gentle iced beverage. Kaiseiki Hojicha – Twigs from the first flush and leaves from latter flushes are lightly roasted to bring you this slightly sweet, rich brew with flavors of chestnut and freshly baked bread. Hojicha is an excellent choice to accompany food. 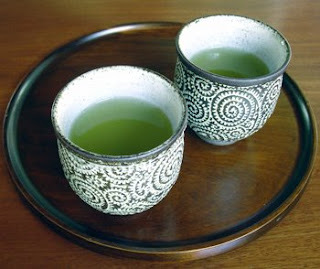 Shouhaku Matcha – Matcha is a powdered green tea of the highest caliber used in the Japanese Tea Ceremony, Chanoyu. It is the unquestionable pinnacle of Japanese tea-making. The color of Matcha is a deep emerald, and its flavor is intensely vegetal (think wheatgrass) and quite viscous, offering an unrivalled taste sensation. Our Shouhaku Matcha (meaning “Pines and Oak Trees”) is a “thin tea,” (surprisingly, they get even thicker) and is one of the favored teas of renowned Urasanke tea sensei Hounsai Daisosho. Matcha is vigorously whisked with a bamboo tool called a “chasen” in a special Matcha bowl called a “chawan,” and as such, the portion is small and cannot be made to go.